**Provide entertainment & amazing selfies with the Selfie Circle by Rockin' Ramaley. We are extremely excited to add Teens into the Fashion Show!! Missing Piece is working hard to provide teen clothing & accessories to our customer base! Grab a friend, and enjoy some fabulous time together, while seeing our newest clothing & accessories that will be available for Spring & Summer! Call the store to day to reserve your tickets priced at $30! We normally do sell out, so call today! (610) 759-4033. Sorrelli is a family-owned jewelry design company founded in 1983 and based in Kutztown, Pennsylvania. Sorrelli jewelry is handcrafted from genuine semi-precious stones and high-quality Austrian crystals. Stop by and get a great Valentine gift. We are having a 50% off sale on all our clothing the whole month of February!!! We still have a great selection of Fall Fashions. Lori Bonn, Lenny & Eva, Waxing Poetics, Chamilia and many more brand names. includes light refreshments & swag bag! 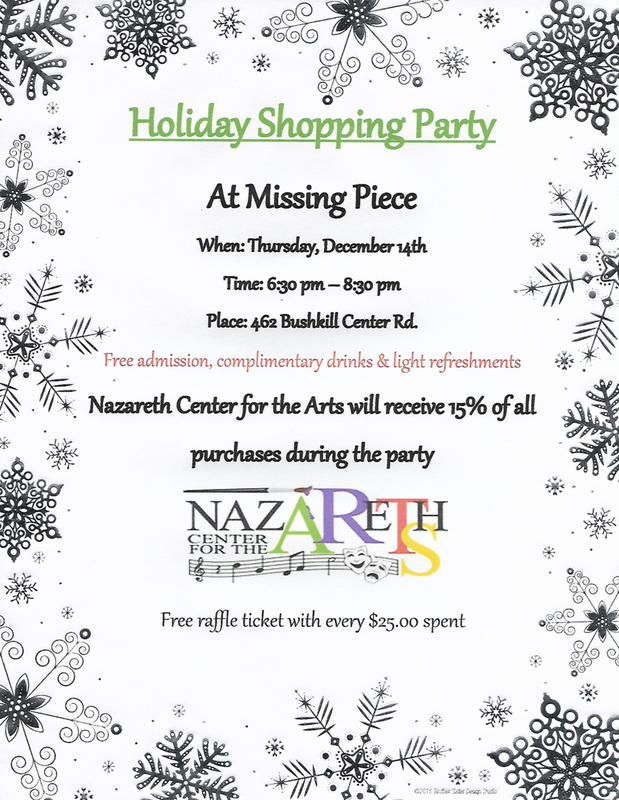 Santa will be at Missing Piece in Nazareth on Saturday, December 1st!! Stop by with your children for FREE photos with Santa!! Santa will be at Missing Piece from 12-2! Then we will have a table with gifts for your children to buy for their family. Spend $125 on Brighton, receive a free tote. Spend $125 on Vera Bradley, receive a free tote. Spend $100 on Nora Fleming, receive a free Mini. Join us on November 17 for a day of fun. Come meet the sales rep from Lizzy James who will show you all the new Jewelry. Come celebrate You with Us at Missing Piece! We are throwing a party Missing Piece style for our customers to show our appreciation for your loyalty, support & friendship!! Come in and meet our sales Rep from Brighton. There will be many pairs of shoes to choose from as well as many styles of Hand Bags. COME OUT AND SUPPORT JENNA KEISER AND HER FAMILY ON THURSDAY SEPTEMBER 20, 6:30 -9 pm! Limited class size. Please call Missing Piece to reserve your spot. starting 2 weeks earlier than last year!!!! starting on Thursday August 23. Furniture and So Much More. Hundreds of items to choose from. Start your Christmas Shopping Early. Missing Piece wants to THANK ALL the amazing teachers for the support and guidance they give to our children every day! When the school bell rings join us from 2pm-6pm for cocktails and cupcakes and receive 20% off your purchase (with school I.D). Make a purchase and at checkout you will pick an Easter Egg. Inside there is a discount for 1 item ranging from 15% to 50%. Please join us for a night of fun, shopping & fundraising! (formerly of Beck's) will be representing Nerium International. yes 100%, of his proceeds to Angel34!! Thank you in advance for your generosity!!! VIAONEHOPE is wine tasting & fundraising tied together. Each purchase is donated to a charity. VIAONEHOPE offers wine, but many other items as well! Stop by & taste some wine & learn more about VIAONEHOPE! Karen will be donating a percentage of each wine purchase to the Nazareth Center for the Arts! We hope you can join us for this fantastic event!! Retired Brighton Purses & Jewelry at 50% off! Drinks and light refreshments provided!